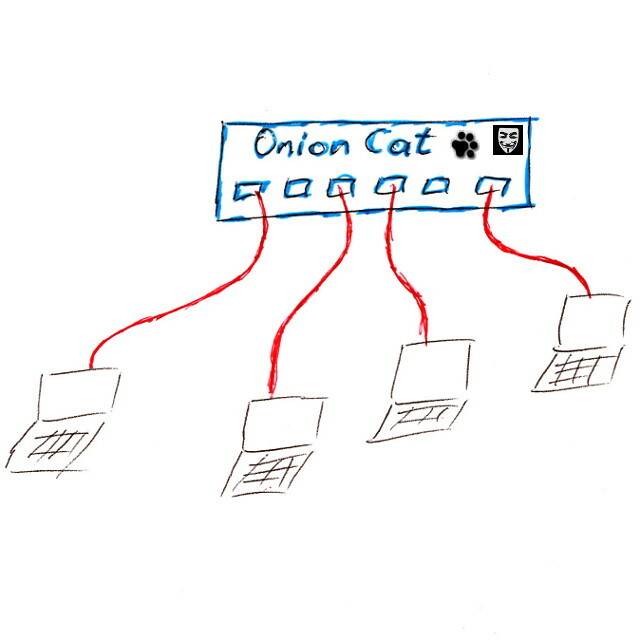 OnionCat is a VPN-adapter which allows to connect two or more computers or networks through VPN-tunnels. It is designed to use the anonymization networks Tor or I2P as its transport, hence, it provides location-based anonymity while still creating tunnel end points with private unique IP addresses. OnionCat uses IPv6 as native layer 3 network protocol. The clients connected by it appear as on a single logical IPv6 network as being connected by a virtual switch. OnionCat automatically calculates and assigns unique IPv6 addresses to the tunnel end points which are derived from the hidden service ID (onion ID) of the hidden service of the local Tor client, or the local I2P server destination, respectively. This technique provides authentication between the onion ID and the layer 3 address, hence, defeats IP spoofing within the OnionCat VPN. If necessary, OnionCat can of course transport IPv4 as well. Although it has native IP support, the suggested way to do this is to configure an IPv4-in-IPv6 tunnel.